J is six months old! Half of an entire year has gone by with this sweet boy in our lives. 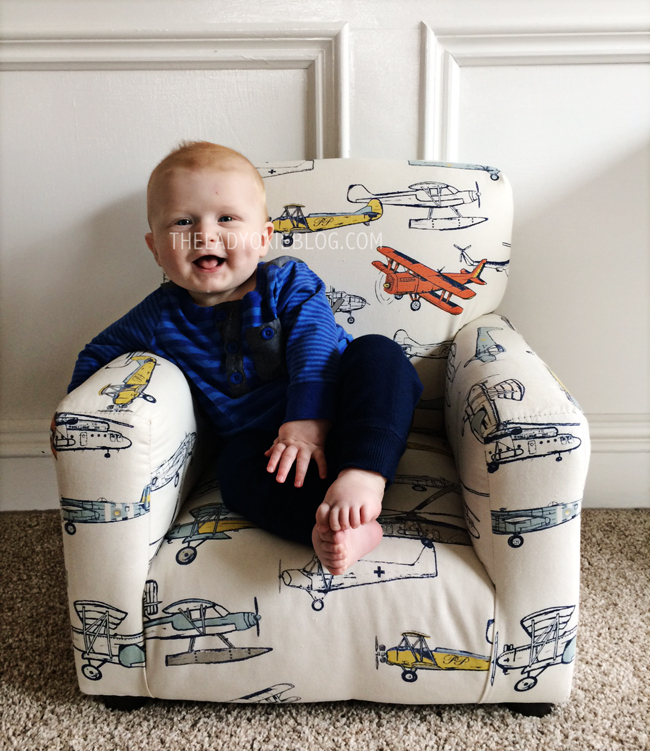 I haven't been doing monthly updates on the blog, but I felt like I wanted to spend some time writing out what J is up to these days in honor of his half birthday. 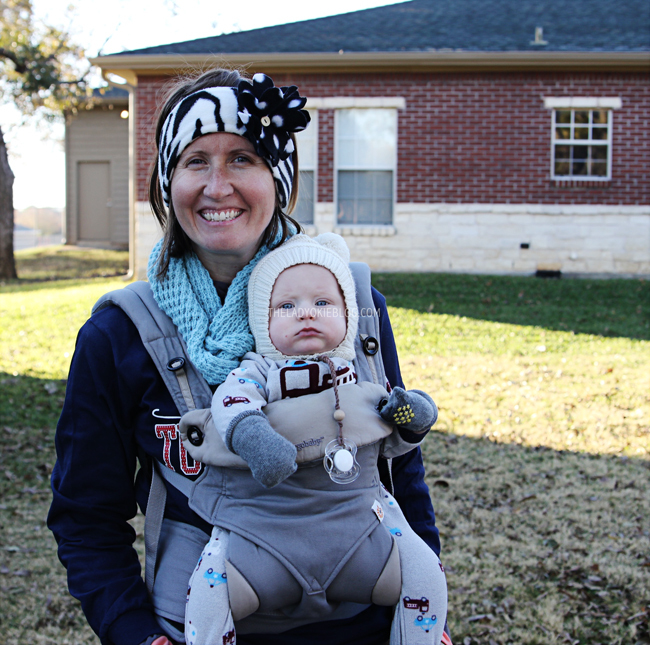 I read through R's six-month update, and it was fun to see what she was doing at this stage in comparison. Some of it is similar, and some is very different! 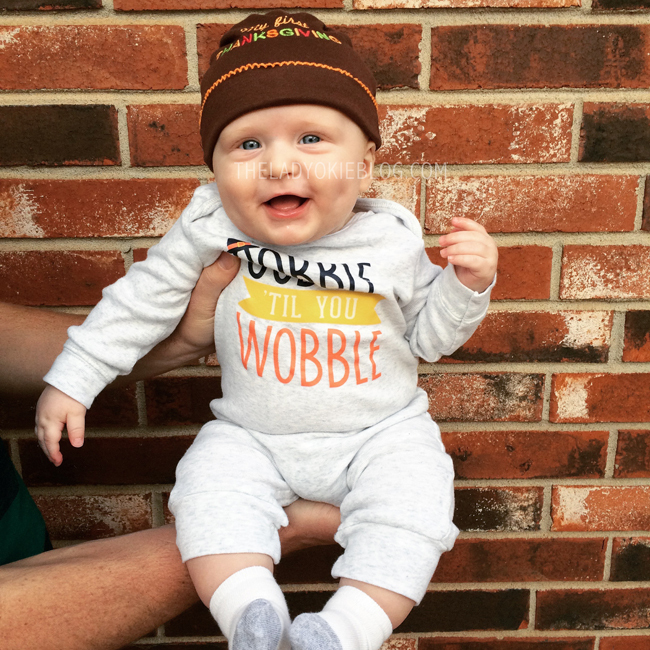 We finally started purees with J at the beginning of this past month, and he has been chowing down. We really should have started earlier, because he was definitely ready to start eating! I had completely forgotten about how much people on the internet like to debate about baby-led weaning and purees and of course the horror of rice cereal. lolz is all I have to say about that. Everyone needs to calm down. I love feeling so much less stressed out about the whole eating thing that I was with R. I remember feeling so anxious about all of it, and I'm really not so much this time. I'm growing! haha. He's still breastfeeding, and I'm pumping 2x a day at work, which is going well so far! I've been back for 2 weeks, and each week I've had 50 ounces of milk to freeze. 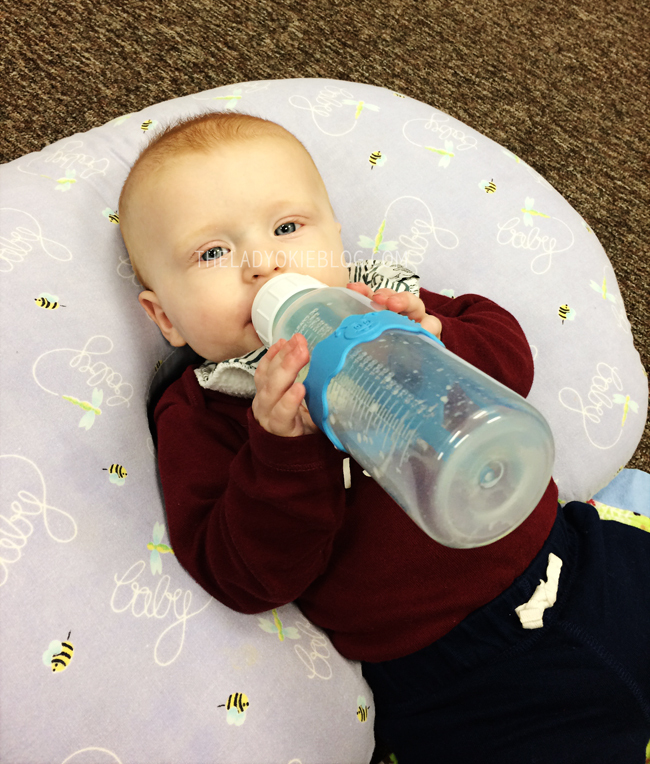 It took about a week for him to get used to taking bottles at daycare. We had given him bottles at home before, but for whatever reason he refused his daycare bottles and then would eventually drink just 1 ounce or so out of the 4oz that I put in his bottle. But by the end of the week he was doing better, and the second week, he was drinking the whole bottle. On this point J is much different than big sister. She was sleeping 7:30-5:30 every night according to her six-month blog post. J.... not so much. Up until a week ago, he was still waking up 3-4 times a night and I was not having a good attitude about it. MAMA TIRED. He has, however, always been a pretty good napper, so that was nice. But still. During the night, he would wake up every 3 hours almost on the nose. At his 6-month checkup, the doctor was like, so he's sleeping through the night, right? Like it was this casual thing. HA. no. He's never done that. But thanks for asking, I think? Rude. He has been sleeping in the bassinet next to my side of the bed since he came home from the hospital, and we've been wondering when or how we should make the jump to him sleeping in his crib in the nursery, which he and R are going to share. I went to a women's event at church last week and got talking to a friend of mine whose daughters have shared a room since the youngest was a few months old. I told her that we wanted J and R to share but were nervous about it, and I asked her how we were supposed to go about it. She told me something profound: just go for it. We had been waiting for something to happen, I think, or something to tell us that it was time, but after she said that, I realized that we really just needed to do it. I came home inspired and told Jordan and we were doing it the next night. Long story short, it went really well! I set low expectations and thought it was going to be a disaster, but it wasn't. R did wake up crying once and woke J up, but when he woke up later crying, she stayed asleep. AND he slept from about 8:30pm to 1:30am, which is by far the longest stretch he's ever had! The next few nights he slept well also and only woke up 2 times (and I only fed him one of those times). So we are really excited about that, and I guess they are officially sharing a room now! Jordan is giddy with excitement that J is out of our room, and I have to say that it is nice to be able to talk in a normal voice and turn the light on in our room again. But I miss being able to just look over and see J. I didn't get emotional about it and cry or anything, though. Probably because I was too focused on the fact that he and R were finally sharing a room after all this time. J started sitting up this month! It's been so nice because he has been a lot happier being able to see more and look around. It's also been super cute, because R has been interacting with him more and actually attempting to "play." 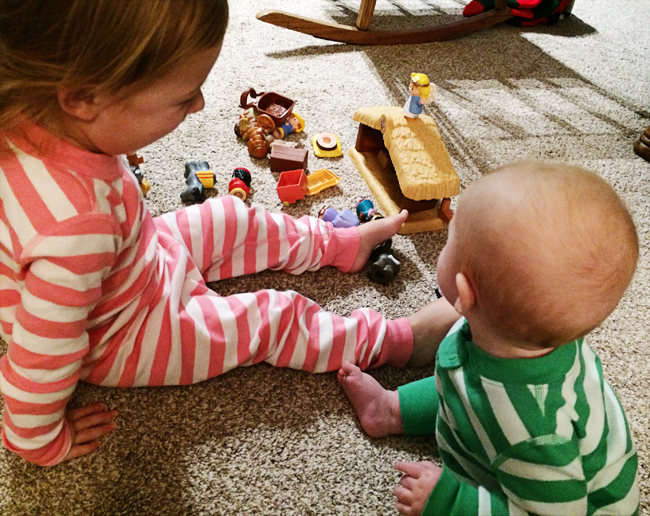 He loves loves loves to watch her, and he's very content to sit up and play with toys that we put on the floor in front of him. He can roll from front to back but can't roll from back to front (same as R at this age), so he still stays in the same place we put him on the floor, which is wonderful. He does okay with tummy time but largely prefers to be sitting up, although I still try to make sure he gets floor time so he can practice rolling and such. When he's lying on his back, he loves to grab his toes, which is the cutest thing. He loves taking baths and will sit in the bath seat just looking around and smiling. Everyone who sees J always comments on the same two things: 1. His bright blue eyes and 2. His smile and how happy he is. Truly, he is such a happy, smiley baby and a joy to be around. He's super ticklish on the inside of his thighs and the side of his neck and will giggle so much that he gets overwhelmed and starts crying. He thinks it's hilarious when we bounce balls on the floor. He also loves "chasing" R around. She will say, "Come git me, Baby J," and I'll hold him out and run toward her and she runs away laughing. When I reach her, I hold J out so he can "tickle" her, and they both crack up. J is content to be passed around to nearly anyone, although he clearly loves his mama the best, and even Jordan will tell you it's true. When I visit him at daycare during the day or pick him up at the end of the day, he gets so happy to see me. He kicks his legs and gives me the biggest smile. If he's facing away from me and hears my voice, he turns all the way around to look at me. He's getting to where he can fall asleep on his own, but I still love to hold him whenever I can. It's true what everyone told me: little boys love to cuddle. I just love him so stinking much and am so thankful he's part of our family! Yay for sleeping getting better and sharing a room going well. I'm glad sharing a room is going well! Hopefully the little guy will start sleeping through the night soon for you guys. Those dimples are just the cutest!!! That's so sweet that they are sharing a room, so glad it has worked out. I just love his round little face! He is so adorable! I hope his blue eyes are here to stay! Man... sometimes I'm so ticklish I cry, too. Haha! No shame in that, Baby J! Wow, 6 months already! Goes by so fast. He sounds like such a sweet & happy baby, and SO CUTE! He seems much like I remember Abel from that age, including the no teeth - He didn't get one until 10-11 months! So glad the transition to sharing a room went well. I can't get over how bright his eyes are!! I cannot WAIT until Imogen starts sitting up on her own. She's close, but she still face plants (or would, if I didn't catch her). I feel like our (her) quality of life will greatly improve once she's 1) sitting and 2) crawling. We're going to start solids on Christmas! I'm excited. We're thinking sweet potato puree, and maybe just hand her a chunk of banana and see what she does with it. I've read that banana can be constipating, though - have you found that to be true? I think it is so cool that you do these monthly updates. You are going to love having them to look back on when they are older and running all over the place. He's such a cutie! Good thing you wrote down when different milestones came with R so that you can look back at those--I can definitely see how everything would blur together after a while. Oh my goodness his smile is just the best! What an adorable little guy. Yay for just going for it and room sharing going well! Hope those stretches of sleep just keep getting longer. Happy half birthday, J! Yay for getting more sleep! I can’t believe how big he is getting.